After an 16-year quest that had seen its share of heartaches over the years, Mark Raveling and Mike Luhman finally have done it. 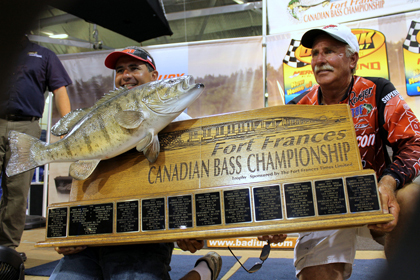 With a three-day total weight of 55.06 pounds, the three-time runner-ups at the Fort Frances Canadian Bass Championship finally were able to hoist the trophy late Saturday afternoon at the Ice For Kids Arena after being crowned the 2012 winners. “We’ve been waiting for this for a long time and we are really excited about this,” smiled Raveling, who hails from Longville, Mn. “It was a magical run to lead wire-to-wire, to have the big fish during the first two days, and we didn’t lose any fish at all, so it was flawless,” enthused Luhman, who lives in Deer Park, Wis.
After vaulting into first place with a five-fish bag of 19.73 pounds on Day 1, which included a day-best 4.82-pound lunker Luhman reeled in, the duo stayed atop the standings on Day 2 with a 17.49-pound haul. That bag, which included a 5.25-pound hog that eventually proved to the biggest bass caught during this year’s FFCBC, left Raveling and Luhman with a two-day total of 37.22 pounds­—giving them a 1.85-pound lead over defending co-champs Glenn Leroux and Trevor Zimak of Thunder Bay. “The first fish we caught was Mike’s fish, which turned out to be the big fish of the day, so what a great way to start,” Raveling remarked. “We followed that up with a couple of more fish, and we also caught a small two-pounder, which can sometimes come back to haunt you. “But it didn’t this time,” he noted. Having left the Sorting Gap Marina at 7 a.m. as tournament leaders at the start of Day 3, and returning with the other 14 boats in the championship flight at 4 p.m., Raveling and Luhman had to wait almost another two hours before they weighed in their five fish. As their boat was towed into the Ice For Kids Arena, waiting for them on stage were leaders Chad Johnson of Rogers, Mn. and John Janousek of Nisswa, Mn., who had reeled a day-best total of 18.88 pounds on Saturday. Having entered the final day in 12th place, Johnson and Janousek were able to outlast 10 other teams with a three-day weight of 51.83 pounds, which was something Luhman was keeping a close eye on. “I was peeking in before we brought our boat in, and I was a nervous wreck,” he admitted. “I had heard what Johnson and Janousek had, and I quickly checked the paper and I thought that we would have enough to go over top of them in the standings. “As they kept weighing the other teams, though, they were staying up in the lead, so when we came in and I saw them sitting in the hot seat, I was confident that we had enough,” Luhman added. Needing at least 14.62 pounds to overtake the leaders, Luhman and Raveling had more than enough—their 17.84-pound bag gave them their first FFCBC title. “When we saw that weight come up, it was a feeling of relief,” Raveling recalled. “We’ve been coming up here for so long, and have had so many chances at winning it, so it really feels good to finally do it,” he added. Jeff Gustafson and John Peterson finished in third place with 50.55 pounds, with Jim Sandelovich/Karl Howells (50.06) and Ted Heyens/Leo Heyens (50.05) rounding out the top five. The rest of the top 10 were Scott Ourada/John Allen (50.02 pounds), Troy Norman/Jay Samsal (48.93), Darren Ward/Tony Holenko (48.89), Dennis Barnard/Scott Gobeil (48.33), and Duane Peterson/Travis Peterson (48.17). The Petersons caught the single biggest one-day total weight on Friday—a 20.58-pound bag that rocketed them from 44th place to seventh in the standings. While the top 15 boats after the first two days battled it out in the championship flight, two other winners also were crowned Saturday in the second and third divisions. The Division II crown, which consisted of boats in 16th-55th place following Friday’s weigh-ins, went to Minnesota anglers Steve and Scott Sandberg, who reeled five fish that tipped the scales at 17.46 pounds. And in Division III (which featured anglers ranked from 56th-93rd after Day 2), Bryan Gustafson of Fort Frances and his partner, Jamie Bruce of Kenora, topped the standings with 16.19 pounds. As for the defending co-champs, Leroux and Zimak finished at the bottom of the 15-team championship flight with 45.10 pounds, having dropped from second after hauling in only 9.73 pounds of Rainy Lake bass on Saturday. The other winners of last year’s tournament, Richard Rud and Jon Austin of International Falls, ended up finishing in 17th place in Division II, with a weight of 13.63 pounds on Day 3.